Ang artikulong ito ay tungkol sa ika-39 na Pangulo ng Estados Unidos. Para sa submarino, tingnan ang USS Jimmy Carter (SSN-23). ↑ Warner, Greg. 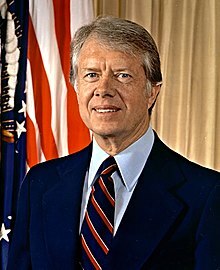 "Jimmy Carter says he can 'no longer be associated' with the SBC". Baptist Standard. http://www.baptiststandard.com/2000/10_23/pages/carter.html. Hinango noong December 13, 2009. ""He said he will remain a deacon and Sunday school teacher at Maranatha Baptist Church in Plains and support the church's recent decision to send half of its missions contributions to the Cooperative Baptist Fellowship.""